I have been wanting to taste this whisky for quite some time. It is a cask strength whisky, which means that it is not diluted to reduce its alcohol content. THIS WHISKY DELIVERS! It has a snappy bite and aggression, and yet a soft and supple delivery with deep and complex flavours. 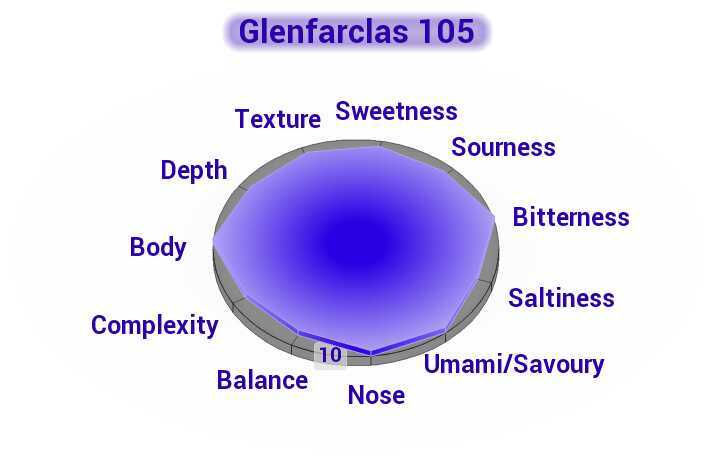 Boasting almost perfect balance and a ferociousness that busts with character, this is the ultimate expression of a Glenfarclas! Neat: Gentle and shockingly mild for a cask strength whisky which fills my glass with pleasant fumes of sweet sherry notes and cherries. A wafting sweetness travels in the air, prompting memories of mulled wine in a pub as snow falls! With water: The addition of water releases some alcoholic vapor that subsequently settles. The cherry notes disappear and in their stead mandarin and tropical fruits like mango are now present. A gentler sweetness develops, but it does not compete with the underlying bitter notes that were evident before adding water. Neat: POWERFUL!!! This whisky explodes with big citrus flavours and a heavy dark rum tang while its sweetness balances nicely with the aggressiveness of the dram, almost taming it after an initial attack. Burt toffee comes to the fore, particularly at the top of my tongue while the sweeter notes remain at the base of my tongue. The two have a little battle for my attention. With water: EVEN BETTER!!! The sheer power of the whisky remains unaffected, as my taste buds begin to recognize sweet sherry with a dry ending. White wine and vinegar wrestle with honeyed bitter lemon. The addition of water definitely draws out new flavours. Neat: Excellent! This whisky finishes in fine form, remaining on the palate (in particular the base and tip of the tongue) for some time after a sip. With water: EVEN BETTER! Ohhh this is fabulous. The taste of sweet sherry and a light rum lingers on my tongue for a very long time after taking a sip of this whisky with water. I cannot fault this whisky. It is a phenomenal whisky that strikes the nose and palate like dynamite. KAPOW!